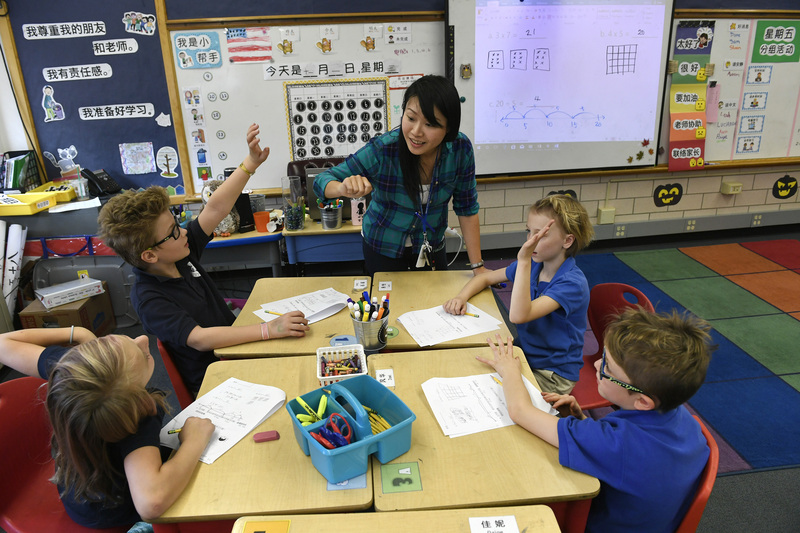 Helen H. Richardson, The Denver Post: Chinese teacher Yu-Hsin Lien, speaking only in Chinese, helps her 3rd grade students with classwork at the Denver Language School on Nov. 1, 2017 in Denver. A Denver charter school that excels on state tests and focuses on preparing students for an increasingly complicated world also refuses to teach English to its youngest students. Kids in kindergarten through the second-grade are instead immersed in Spanish or Mandarin Chinese, two of the world’s most dominant languages. Students pick up formal English language instruction when they enter the third grade at the K-8 Denver Language School, which emphasizes both linguistic skills and cultural aptitude in a student’s adopted language, principal Kathy Benzel said. “We want our kids to do well in not only speaking the language but also knowing about the culture and the people who use that language,” Benzel said. “And our kids adapt pretty quickly. They talk about movies, what they did over the weekend, in a new language. It comes pretty naturally to them to take on something new. Posters, graphs and artwork in Chinese or Spanish dot the classrooms where students chatter and joke with instructors in their adopted language. Many of the Mandarin teachers hail from mainland China or Taiwan, and the Spanish teachers largely come from Spanish-speaking countries. The school sought to hire as many native speakers as possible, so students can hear proper pronunciation and intonation.